Wednesday 17th October 2007 seemed like any other chaotic morning in the Newman house. Everyone getting ready for work, saying their goodbyes and setting off on their individual journeys. Stew left for work at about 7:30am and informed me had a meeting after work and wouldn’t need an evening meal. He was in a chirpy mood and went out singing. The next hour was very much like normal. And… then the phone call that changed all of our lives for ever … “Hello, is that ‘mum’? This is the Bracknell Police, there has been an accident….” I knew immediately it was Stewart. Thankfully, Scott, Stew’s youngest brother had not left for work yet and somehow we managed to get to Frimley Park Hospital. We were met by a nurse and a policeman and ushered into a side room – I can remember thinking ‘This isn’t a good sign’, however, ‘positive thinking’ is me and I listened as best as I could to what the doctors had to say… “Slight bleed to the brain… not able to drain because of where it is… induced coma… ventilated… broken arm and a few facial cuts”. Said they would clean him up and we could then see him in “resus”. Frantic phone calls were then made to his eldest brother and his fiancé, Carly, and Matt his other brother. I had already phoned Trev, my husband and eventually we all gathered at Accident and Emergency where we were able to see Stew. At this stage I still believed that Stew was going to wake when the sedation was reduced and all would be well! They were soon to move Stew to Intensive Care… a sterile place full of tubes, monitors, wires, drips and constant bleeping. Although initially I found Intensive Care quite daunting it became clear that this was a place of calm and control. A nurse allocated to each patient, all of whom seemed to have time to try to explain what was happening and what each sound meant. However, it wasn’t always easy to track a consultant down, or even a registrar and when we eventually did, some were friendlier than others. We knew they had done a couple of scans but didn’t really know what the prognosis was and of course Stewart still remained ‘asleep’. As each day went by something new would happen… Stewart was constantly sweating, (storming – we were told it was called), not just little beads on his forehead but huge beads of sweat all over his body. The nurses explained that it was his temperature control in his brain that wasn’t working properly. This would lead to dehydration and so we were constantly checking on how much, in the way of fluids he was being given. What drugs should he be on? – Trev and I had no idea, so relied upon the professionals! Apparently constant phone calls were made to St Georges Hospital to get some guidance. This was the time that the names of drugs like Baclofen and Clonidine came into our vocabulary. I became quite paranoid about his drugs … What were they? What side effects did they have? What did they actually do? I would come home from the hospital and log onto the internet to find out all I could. 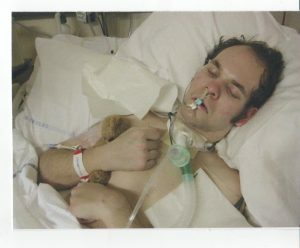 Stewart was given a tracheotomy which seemed to make him look so much more comfortable without the massive tube in his mouth, down his throat and into his lungs. Although the sedation was eventually reduced Stewart seemed to stay in this ‘induced coma’. They would refer to the Glasgow Coma Scale frequently to see if Stewart’s eye, verbal and motor responses were improving. I remember hanging onto every word the nurses might say – ‘flutter of eye lids’ or the ‘twitch of a hand’. However, Stewart remained in this state for quite a few weeks. It was at this stage that one of the ‘friendlier’ consultants had a meeting with Trevor and I – it was made clear to us that, Stew, as he was may be all we would ever get and whatever state he was at about a year would be it. He explained the problems with brain injured patients, chest infections, urine infections, not responding to anti-biotics, the possibility of not treating – it went on and on. Trev and I came out a bit dumb struck – however, with positive thinking and the support of a loving family and friends we believed it would be better that the picture painted. 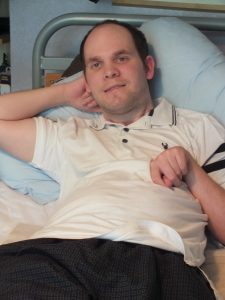 After a couple of months in Intensive Care the bed Stew was in was needed urgently and it was felt that Stewart was stable enough to go into a normal medical ward. This was a really difficult time for me. I was worried about so many things. One of the main issues was the number of nurses to the number of patients. It worked out that there were approximately 2 nurses and a carer looking after 16 patients. This was obviously difficult for the staff but my main concern was that Stewart would not have all his needs met. He wasn’t able to communicate or let them know if he was in pain, or if he needed changing or if he was uncomfortable. So I really felt I needed to be there with him. Initially none of the staff on the new ward, including his new consultant knew Stewart or his medical or recent case history so it seemed essential that I was there to be his mouth piece. Apparently his file was so thick that it would take too long to plough through it! Why the staff on the ‘new’ ward can’t communicate with Intensive Care beats me!! Sadly, many mistakes were made and we had many a worrying time when his drugs weren’t given correctly or at all and his heart rate would go sky high, his blood pressure in his boots, sweating profusely and the ‘crash team’ called many a time just to be on the safe side. Stewart was moved no less than four times during the next four months – four new wards, four new nursing teams and nearly as many consultants. On every change over it was essential I was there to make sure they understood all that had happened with Stewart over the previous weeks and also give them a details of his complicated medical history. Stew was born with a Trachea-Oesophageal Fistula, which meant that his trachea and oesophagus were joined and anything he swallowed went into his lungs rather than his stomach. He was put in the care of Great Ormond Street Hospital where he had a number of operations in the first 6 months of his life. His stomach was eventually pulled up through his diaphragm and situated in his chest cavity, between his lungs. This obviously caused problems during childhood but was proving to be a bigger problem now that he needed a feeding tube inserted. It was agreed that Stewart would need a jejunostomy tube. This was apparently going to be a tricky procedure as the jejunum is small and it is essential that it is inserted in exactly the correct place. Stewart had the surgery and all seemed ok, although he seemed quite distressed for the next couple of days. It was two days after the operation that I received a call at work to say that Stewart was in a critical condition and we needed to get there as soon as possible. Once again phone calls were made and we got to Frimley very quickly. 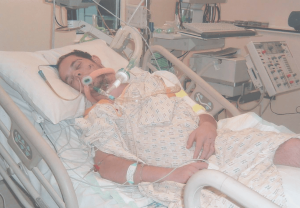 WE were told that Stewart’s bowels had stopped functioning, maybe twisted, following the operation and consequently his faeces were backing up through his stomach, up his oesophagus and down into his lungs. This was all very acidic and they were very concerned as to the damage it would have done. It was also full of ‘waste’ and highly likely source of infection, possibly leading to pneumonia. They started him on a strong dose of anti-biotics and all feed and other drugs were stopped. We would have to wait and see. Thankfully, Stewart, our little fighter, responded to the anti-biotics and after a couple of enema his bowels were working again. Soon after, feeding was to resume. 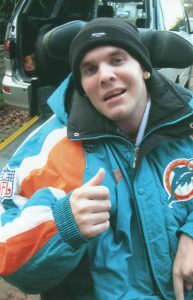 The weeks went by and it was necessary for Stewart to move to a hospital for rehabilitation. It seemed as the decision was to be made by the Primary Care Trust as to where he was to go. They informed us that the best place for Stewart was the Royal Hospital for Neuro-Disability at Putney. Stewart was assessed by the PCT and then we had to wait for a bed to become available. During this time of waiting further problems arose and further worries. However, on a good note Stew had his ‘trachie’ (tracheostomy) removed, which was a step forward but had to cope with doing all his coughing himself, no more suctioning! 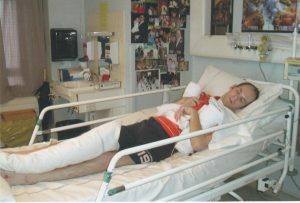 In April 2008 a bed became available in Devonshire Ward, RHN, Putney and Stewart was transferred by ambulance. Stewart was settled into his room and although he seemed agitated and sweaty he looked comfortable. His doctor came and spoke to us straight away and I can honestly say I learnt more about the effects of Stewart’s accident in that 10 to 15 minutes than I did in the 6 months at Frimley. The staff were really kind and I felt totally at ease leaving Stew in their care. It wasn’t long before the physiotherapists, speech and language therapists and occupational therapists started work with Stewart. At this time we had quarterly meetings with the Putney team and the NHS Primary Care Trust to discuss Stewart’s progress and also get agreement for further funding. For quite a while it was unclear about Stewart’s progress, could he see?, was he able to obey commands?, did he understand what was being said to him? Thankfully there was always a little something that Stew had done that gave us hope a further funding was agreed. (Sadly this isn’t how it works now). He was left with a nasal jejunum tube for feeding, fluids and medication as his jejunum was not able to withstand more surgery for quite a while. He was to be fed like this for a further 6 months and it became necessary to have his right hand enclosed I a ‘boxing glove’ to stop him pulling his tube out. This tube was more difficult to insert than the more common nasal gastric tube. The only time the glove could be removed was when we were with him. This must have been so frustrating for him as he had started to use his right hand quite a lot. He was able to hold a pen and I was so excited when he wrote something that looked like ‘Stew’ and also tried to play noughts and crosses. I took photos on my phone to show all at home! We would try many different ways to stimulate Stewart, I would read to him, watch films with him, play music, thumb wars, throwing a tennis ball and even taking in children’s learning toys to encourage motor skills. 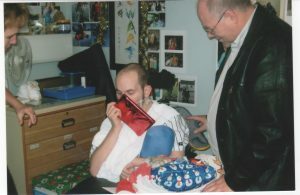 Another break through was at Christmas 2008 – all of us took presents in for Stew in the morning, he seemed to know it was Christmas, he took his presents out of a Christmas sack and opened them on his own using his right hand and his teeth. He even gave us a thumbs up for presents given. His Nan bought him his favourite aftershave and to our amazement Stew took it out of the box and managed to spray some on his neck. Not a dry eye in the room, we all enjoyed Christmas this year! In April 2009 it was felt that Stewart was improving in his awareness and communication (thumbs up for yes and shaking of hand sideways for no) and that he should be moved to Drapers Ward. This felt like a big step forward, this was where patients were eating, drinking, speaking, some walking and most communicating in some way. At the beginning it seemed as if Stew was totally out of his depth, however as time went by he started to use a ‘spell chart’ to communicate with us and started to eat a little pureed food. His sense of humour started to emerge and he was very loving. Sadly he also had times of feeling low and had a very poor opinion of himself and we started to worry about his state of mind. A psychologist started to work with him along with a speech and language therapist. He was certainly frustrated and seemed even depressed. It was agreed that it was time to try to get him home, even for a day or maybe a weekend. The OT’s visited our home in Woking to ensure it was suitable for Stewart’s wheelchair and thankfully we got the ‘green light’. Initially we took him home for a few hours. He loved it and I will always remember seeing his face when he saw our road and then our house. Drapers Ward had a ‘family unit’ for us to learn how to look after Stewart. Trev, Scott, his youngest brother and I stayed there for a couple of weekends. We learnt how to hoist Stewart, how to wash and care for him, administer his medication and take care of his feeding regime via his tube. The local district nurses organised a hospital bed and hoist to be delivered to our house. We transformed one of the rooms downstairs into Stew’s weekend bedroom and he started to come home at the weekend. Trev stayed downstairs with him overnight, sleeping on the settee. At this time Stew’s short term memory was not very good. By the time we had travelled back from Putney (35 minutes) he had forgotten he had been home. This was such a frustrating time for him and heart wrenching for us to have to leave him somewhere he didn’t want to be. So after a lot of discussion we decided to bring Stewart home for good. By now we had been in Drapers Ward for a long time, (far longer than would be allowed now) and so Stewart was moved to Evitt Ward, a long term ward also at Putney until he could come home. So decision made – what next? We were put in contact with our local council ‘Homelink’ and also Surrey Social Services. Homelink is a small, not for profit Home Improvement Agency. They are funded and supported by local and central government. They offer advice, support and assistance to the elderly, disabled and vulnerable people who wish to repair, improve or adapt their homes in order to still be able to live there. Stew had always lived at home prior to his accident so this applied to our home. Meetings were arranged and Occupational Therapists came to assess our house and decide what alterations could be done to get Stewart the approved size of bedroom and wet room. Stewart was entitled to the full Disability Facilities Grant (DFG) of £30,000. The alterations to our house would exceed this amount so a top up would be necessary. Would this be agreed? This grant and top up was means tested on the disabled person, and lengthy forms needed to be completed. Stew had always lived at home and like most young people in their early twenties had zero savings. So with the help of Homelink the forms were completed and the necessary bank evidence presented and all was agreed. Next step, get the architect in, the plans were drawn up and agreed by the council. Once agreed, building contractors were asked to put in tenders for the job and once the council decided who was to do the work, the revamp was ready to start.. The building work began on 17th October 2011, ironically 4 years to the date of Stewart’s accident. Whilst the foundations were being dug we were still able to live in the house, Stew remained at Putney and continued to come home at weekends. This was until the electricians came in to check the circuit for Stewart’s new room. Not good, we were told the house needed to be completely re wired. We all had to move out! Trev and I moved to my mum’s house and we were still able to bring Stew there at weekends. We eventually moved back home during March 2012 and Stew was soon to come home for good. Meetings were set up with his GP, Occupational Therapist, Dietician, Nutritionist and Care Agency to plan for his home coming. The care agency was selected by the then Primary Care Trust (now known as the CCG’s). Stewart was given 24/7 carers. One, a ‘live in’ carer who works from 8:00am through to 10:00pm and then a ‘waking carer’ from 10:00pm to 8:00am. The ‘live in’ carer is with us as part of the family, has their own bedroom, has their meals with us and goes on any family outings we have with Stewart. During the years that Stewart has been home we have seen constant improvement, although still unable to drink Stew can eat well, loves a roast dinner and an occasional McDonalds. (Mind you we still have to ensure food is cut up well and not too chewy.) He communicates very well, either spelling words out, writing them or mouthing them and his short term memory is probably better than mine! Stewart goes for physiotherapy and sometimes hydrotherapy once a week, which we finance ourselves. From what we understand his discharge notes from Putney did not include physiotherapy as being necessary and therefore the CCG’s will not contribute. We love having Stewart home, but we understand this may not be possible or even an option for some. It is also hard work and a constant pressure to ensure that all the relevant issues are under control, from provision of carers and ordering of supplies to arranging and getting to various appointments and meetings. Brain injuries affect people in many different ways,as you can see from the stories of the five of us who founded Brain Injury is BIG and also from the various issues that are raised on the Brain Injury is BIG forum (see link). However, despite all the difficulties we have faced, my motto throughout has been Never say Never!